One of the largest man made creations that can be recycled and restored is a house. Kristin Wells is the former cohost of Turner South’s “Homemakers” and host of HGTV’s “Smartfix”. Kristin has renovated quite a few houses for reuse and thus has recycled them and many of their components. She will be sharing some home renovation stories as well as recycling of items for home decor and other purposes. to see how it all turns out! ” The Home Makers show is all about the total renovation of a 1905 bungalow in Charlotte, NC. 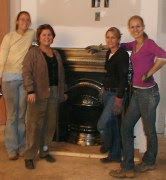 The chimneys were not worth saving but they wanted to salvage and remodel the fireplaces. Although not functional, they were great features in this house. Our assignment: add cast iron surrounds and mantels that will suit the period and decor of this great home! While there are a lot of home design shows on the air these days, you’ll find this show to be particularly inspiring; the design and construction crew are all women! Upon our arrival, we were warmly welcomed by the entire cast. These ladies are personable, beautiful AND they really are professional contractors, carpenters, designers and more – all the talent you would want to have on hand to build or remodel your house. Despite the most miserable weather you can imagine, none of the crew complained about the cold, the endless red clay and the various types of wet and solid precipitation falling outside, so we tried to take it in stride too. They never missed a beat and work continued both indoors and out, with every task getting done efficiently. We were totally in awe of the whole team. This is the first fireplace project we’re aware of to be filmed and explained in such great detail, and we promise you’ll learn a lot about fireplace restoration, so be sure and set your VCR so you don’t miss a single episode. The greatest aspect of this show is that it will serve as inspiration to women to tackle construction jobs in their own homes. Whether you decide to do the job yourself or to hire it out, you’ll know every step of every phase, from demolition to project completion. You’ll see, you CAN do it! This project began the same way as it does for most of our customers, who largely find us via our website. The producers of the show found us online and called for some design ideas. They e-mailed us photos of the fireplaces in their existing condition, provided some crucial measurements, and shared their vision for how the room will look when it’s completed. We e-mailed them back some design ideas, including simulated photos of some styles to choose from. They made their choices within a day; we packaged the products and they were on the way to the job site by the next day. “Kristin Wells, host and contractor on HGTV’s Smart Fix, was introduced to the world of carpentry at a young age. Her father’s knack for fixing things and watching HGTV programming piqued her interest in home layout and design. Kristin soon began working with local builders to get hands-on experience with home repairs and renovations. 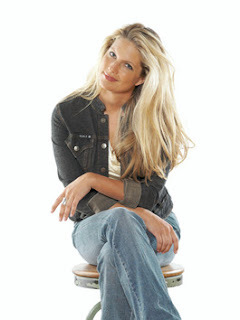 Eager to put her building and design skills to use, Kristin formed a construction company in 2003 where she worked with clients on all aspects of home remodeling.